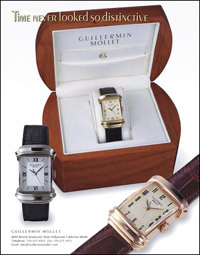 The Guillermin Mollet wrist watch is entirely Swiss made and is available in a limited edition of 150 pieces each in yellow, rose and white gold. Each watch is constructed entirely by hand, and individually engraved and numbered in the small town of Bulle, Switzerland, near the village of Gruyere. The case is finished to the highest Swiss standards, and is supplied with a high grade ETA 2000 series automatic winding movement. The watch, in the classic Swiss tradition, screws together to protect against dust and moisture. A variety of dial designs allows for individual expression. We offer both Roman and Arabic numerals, with several distinctive finishes. Choose the one that most suits your personal style. Each watch is fitted with a genuine Alligator strap, made entirely by hand in Italy. We offer these straps in three classic colors- black, brown and rust in glossy and mat finish. All our straps are fitted with Retracto integrated spring bars for easy removal, giving you the freedom to change the strap to suit your attire. Each strap is finished with a hand made18Kt. 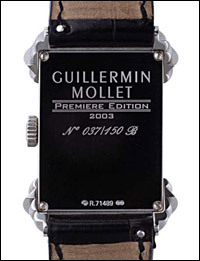 matching sculpted buckle designed to fit the distinctive style of the watch. Click here to view information on the buckle and strap. Click on images below for enlargement.